is a doubly strange concept for many today. To begin with, the notion of queenship sounds alien to some people in an age of democracy. Moreover, some see such a title as “the Queenship of Mary” to be an example of ideas about Christ’s mother they consider “over-the-top” at best. But it is a mistake to view such titles and devotions as the “Queenship of Mary” in isolation from the saving work of the One Mediator, our Lord and Savior Jesus Christ, as revealed in Scripture. To be sure, Mary had a unique and critical role – beginning with her saying “Yes” to God, continuing through our Lord’s life and death on the cross, and even being present at the great Pentecost event – but everything Mary was and everything Mary did was made possible by the grace of Christ (her son though he was) and was a manifestation of her faith. We see all of this tied together in the account of the Visitation (Lk 1), as Elizabeth proclaims the blessedness that flows from Mary’s faith and Mary herself exults in what has been done for her (and for all) by the grace of God her Savior. We must remember also that our Lord promised a kingly eschatological role to his followers (e.g., Mt. 19:28). This kingly role that awaits us flows from the power of faith and the power of Christ’s grace – all of which was exemplified in that humble teenage mother who said “Yes” to God. 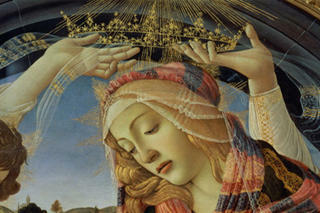 For all of these reasons and more, the Church celebrates today the Queenship of Mary.